San Diego Chargers DE Corey Liuget Finds Success with BrainMaster Equipment - BrainMaster Technologies Inc.
We are fortunate to be working with Corey Liuget, 2011 first-round draft pick starting defensive lineman with the San Diego Chargers. He has added BrainAvatar neurofeedback to his 2014-2015 training regimen, and talks about focus, “not thinking,”, and being in the zone. 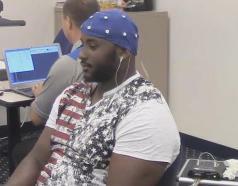 He is off to an excellent season start, having done a great job in 1 quarter against San Francisco, where he “terrorized the 49’ers.” Corey uses several neurofeedback training methods: 19-channel Live Z-Score (LZT) surface and sLORETA Region-of-interest (ROI), MicroTesla EEG-Driven Transcranial Pulsed Electromagnetic Field (pEMF) Stimulation, and 4-channel Live Z-Score (LZT) surface training.